A player persecutor is a free flying camera without a physical body that follows the target node at the specified distance. The exact point of the target it follows is called an anchor. The persecutor can either turn around its target or its viewing direction can be fixed. It is approximated with a sphere, which allows it to collide with objects (but it cannot, for example, push them or interact with them). 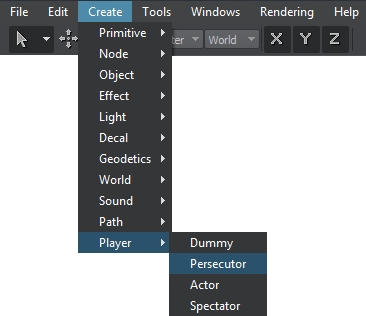 On the Menu bar, choose Create -> Player -> Persecutor. Place the camera somewhere in the world and specify the required parameters via the Nodes window. Indicates if the persecutor can freely rotate around its target or it is oriented strictly in one direction. If checked, only the phi angle is fixed, the theta can change. Indicates if controls of the player persecutor are enabled (the player responds to them). Indicates if collisions for the persecutor are enabled. A collision bit mask, specifying which objects can be collided. Coordinates of an anchor point along the X, Y and Z axes (in the target node local coordinates), to which the persecutor is bound. The minimum possible distance between the persecutor and the target. The maximum possible distance between the persecutor and the target. 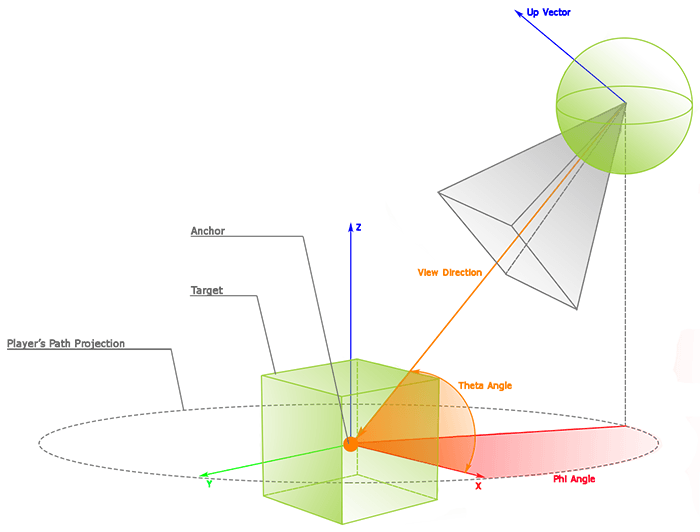 The minimum theta angle (zenith angle, also known as pitch angle) that determines how far upward the player can look. The maximum theta angle (zenith angle, also known as pitch angle) that determines how far downward the player can look. In the Materials tab you can add post-processed materials to the camera. 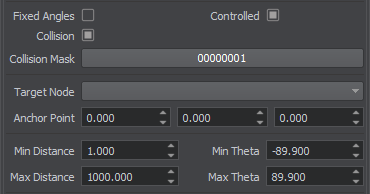 They will be applied after all other post-processes (such as HDR, DOF, etc.) are applied. Add a post-processed material from the dialog window appeared to the materials list by using the .